ya its been soo long since i posted here... its also my first post for Feb, jus cant believe days simply run with soo much happening around. Here is a special card close to my heart. The base design was inspired from a pic on pinterest... like flowers peeping out and it jus got stuck to my mind. 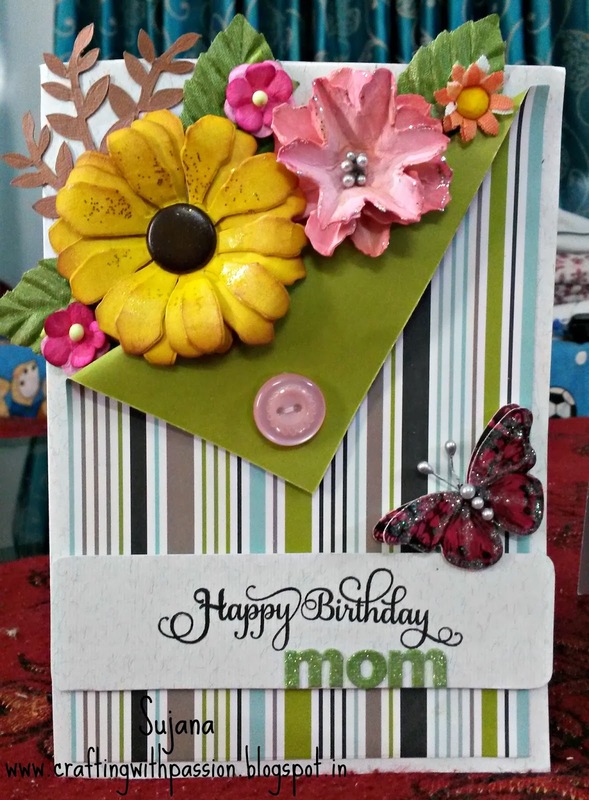 The flowers are all made using Tim holtz tattered florals die. This is one of my first successful attempts with them. The yellow sunflower layers are held together with a brown brad and glittered with gold fevicryl 3D glitter with my fingers. And for the pretty pink flower i hav used silver pollens n silver glitter. Once the flowers were done and placed... the rest all was a breeze to do. Thanks for dropping by, do share ur comments. Once again, a lovely creation Sujana.The flowers are bright and beautiful!. The font of Happy birthday is very nice. Is that stamping?. very pretty card, Sujana, love that folded down corner !! Oh my this is a stunning creation...love the flowers you created and the fold-down top. So lovely. Thanks for joining us this week at Craft Your Passion and helping to celebrate our 200th Challenge !! Good luck. Beautiful card Sujana ..love the the flowers and the way you have created that pocket ..Looks just amazing !! Lovely card...Flowers are very pretty..Did you stitch the button..
Those flowers are stunning. Simply gorgeous. Beautiful! Love the way your flowers turned out. Thanks for joining us at Alphabet Challenge Blog. I love this card! The flowers are gorgeous and I love how they peek out of that folded back corner. Love the stripes next to the flowers. Just a wonderful composition. Thanks for joining our 200th Challenge at Craft Your Passion. I hope we see you again soon.